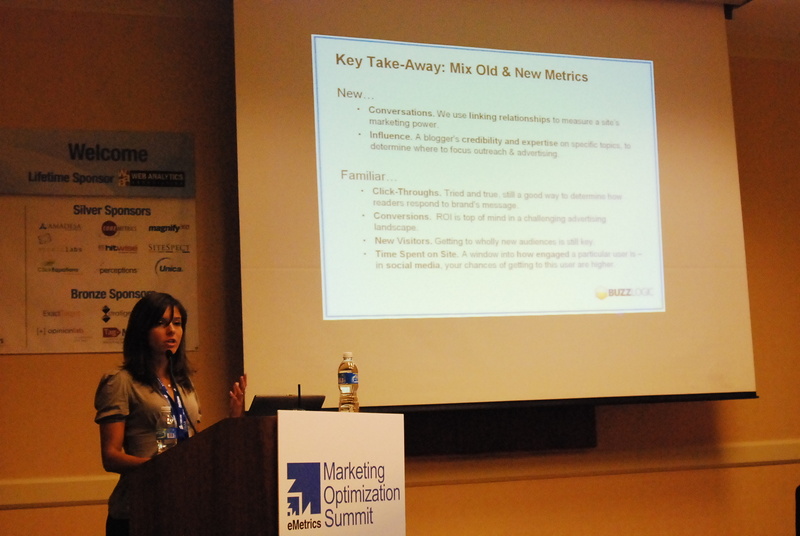 The third day of the eMetrics Marketing Summit was chalk full of great information, just as the prior days were. I found myself completely enthralled with everything in the Social Media track, even the Word of Mouth Metrics session. In this session Sandra Ponce de Leon of BuzzLogic and Ann Green of Millward Brown presented some interesting information when it comes to measuring the effects of WOM campaigns. Social media means a lot of different things, it can mean social platforms, social bookmarking, etc. This fact makes measurement challenging, and without measuring where do you know where do you place your marketing dollars. More and more, marketers are having feet to fire – measurable results are demanded! Blogs: “old timers” in terms of consumer adoption and maturing. Blogs are pretty much mainstream these days. Over 77 million visitors go to blogs which is much more than Facebook or Myspace. measure influential content in social media across any topc and ..
Why does measuring influence matter? Great example of this is Google- simple, easy to do, goal was to build a great product, they spent virtually no money on advertising. Google is now a top 10 valued brand. 89% of all marketers told MillwardBrown that they execute integrate marketing campaigns (across all fronts). But marketers also want to understand the impact of WOM. Its all about accountability, spending little on WOM. Word of Mouth Marketing does not operate in a vacuum, it’s about understanding its role in the purchase process. 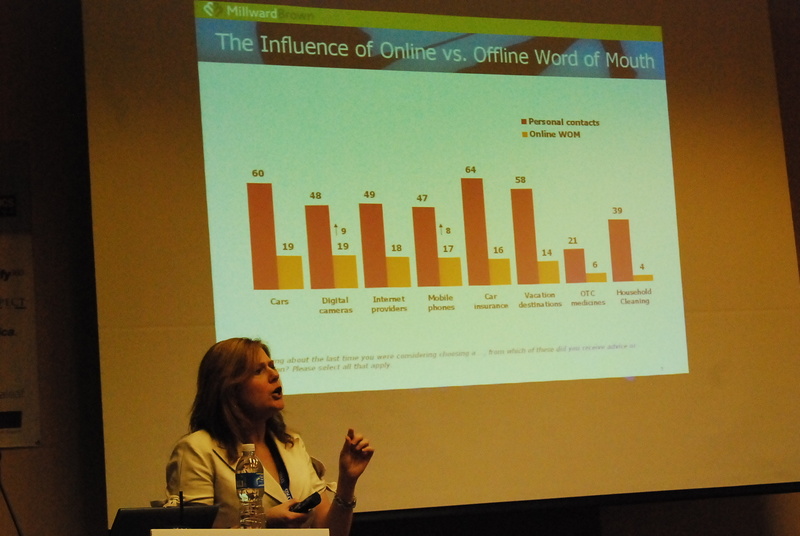 However not all Word of Mouth Marketing is all about online, WOM is a hugely influential touchpoint from any medium. In the end marketers need to make the distinction between buzz and advocacy – they build brands in totally different ways. This entry was posted in Analytics, Word of Mouth Marketing and tagged Analytics, emetrics, measurment, metrics, word of mouth, Word of Mouth Marketing by Liana "Li" Evans. Bookmark the permalink. Did they discuss any tools in particular for measuring WOM? Hi. Widgets are becoming a staple in the smart social media.There is another way to increase traffic to site using Tell a friend widget.It’s completly free widget which allows content sharing without forcing visitors to leave your site.it can be downloaded at for free at http://tellafriend.socialtwist.com/index.jsp . Thought you’d have something to say about it too. @Michael – Hey! Thanks for commenting :). The only tool they talkded about, and it was only by Sandra – was BuzzLogic and what it could do – almost a little too much. It doesn’t seem like that here, but I tried to glean the highlights of the more important stuff from the sessions. Ann didn’t talk about tools, more the facts of the ways to measure and that usually one tool is not the answer. @Sean thanks for bringing it to my attention. when i get a change I will check it out. Unfortunately this session was more about Word of Mouth Marketing, there was a session about widgets but I did not attend that one. @Sandra – sorry about that. it’s fixed now, too many “metrics” words my brain and fingers were all on Metrics, doh!